The planet of Margra is drawing closer to the brink as Shatterwing's debris field grows increasingly unstable. Salinda and Garan fight Gercomo in dragon form, with unexpected consequences and end up making matters worse. Laidan’s life is saved but at great cost. Sartell has become dangerous with conspiracies and betrayal everywhere. Brill and Danton gamble with their lives to find the location of the stolen dragon wine while Mandin gambles with her life to save her daughter. Nils searches for the writings of his grandsire, Trell of Barr, which may contain the much needed information on how to avert moonfall. If you want to know what it feels like when a story is poised on the edge of something dark, dangerous and brilliant then take this series on. And by poised I in no way mean paused. The middle two books in this series have had me on my tip-toes teetering toward the edge and leaning into a delicious slow-burn build-up. My journey from Deathwings to Bloodstorm has also seen me do a complete flip-flop on a character. (This is the brilliance I mentioned.) When Hanson can introduce a character as the epitome of mistrust, mistress of debauchery and in all honesty a shameless representation of someone owning the gates to the darkest hole of humanity and then turn that character sufficiently to become someone whose hand I want to hold as I tell her how I believe in her and that she can make everything right... yep, brilliant. Henceforth, consider me at the head of #TeamToola. Until the next instalment, perhaps. 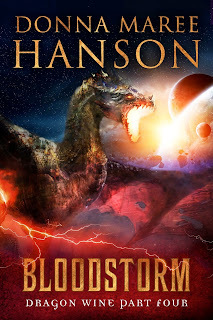 With the fourth volume of Dragonwine, Donna Maree Hanson, successfully continues her build to the finish while masterfully keeping her grip on all the character and plot lines, relaxing and pulling as needed without losing a single one. Moonfall remains present though solely in the urgency emphasized by Hanson's characters and continued focus on the final outcome of the story. Bloodstorm also makes me want to do something I haven't before wanted or needed to do midway through a series. While there has been enough back story to help me remember important points from the previous books without flooding me in detail, I want to go back to book one and start over to experience those bits and pieces again. If you haven't taken a swing at this amazing dark fantasy series yet, you can download yourself a copy of book one Shatterwing complete with the gorgeous new cover here from Instafreebie.